OSWEGO – The Oswego High School Interact Club recently delivered handmade blankets to Oswego Health’s Maternity Center that will be given to newborns. The Interact Club is affiliated with the Oswego Sunrise and Oswego Noon Rotary clubs and focuses on community service. 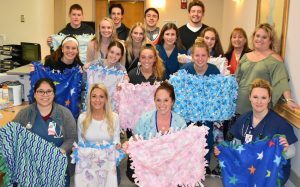 Making the blankets and then delivering them to Oswego Hospital has become a club tradition. Oswego Health’s maternity center offers families a comfortable and homey environment, featuring attractive private rooms, each with its own bathroom containing a large soaking tub. A caring and knowledgeable staff oversees the entire family’s needs throughout the birth experience. For more information, visit oswegohealth.org. For a tour of the maternity center, please call 315-349-5572.